This was an interesting question I saw posted recently. Through SQL Server 2000, trying to delete a user that owned objects was a pain. We had to actually rebuild all the objects, which was problematic. With SQL Server 2005 and later, we got schemas actually added as separate entities, so that solves some of the issue. 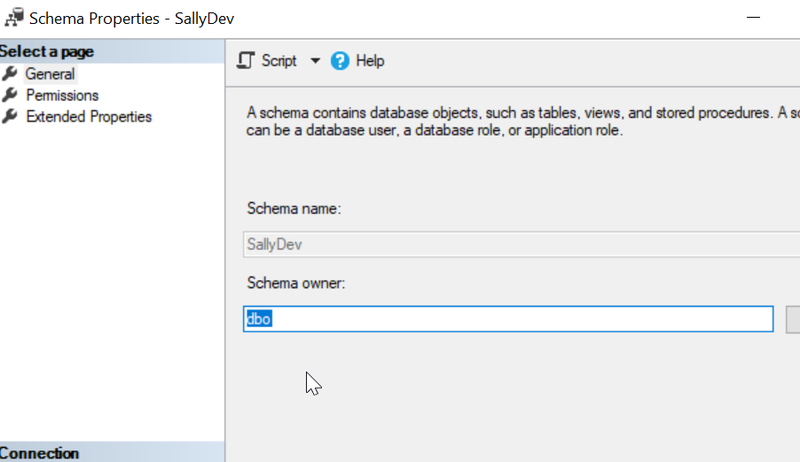 To allow a user to be removed from a database when they own a schema, we need to move the ownership, or authorization of the schema to a new user. Here’s a short repro of what to do. In SQL 2000, Sally would have owned the table and we would have gotten a different message. Now, Sally owns the schema, but the schema now owns the table. I don’t recommend another user as we are just deferring the same problem. Instead, I’d move the schema to dbo. Once this is complete, we can drop the SallyDev user. We can also verify the schema has moved to a new user.